Today Boston 1775 features an essay from guest blogger Russell Potter, author of the new novel PYG: The Memoirs of Toby, the Learned Pig. 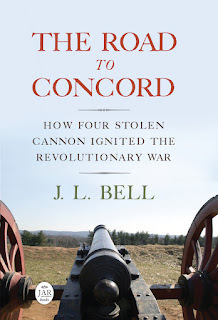 Check out his blog for more information about that book, set mostly in eighteenth-century London. This posting tracks learned pigs across the Atlantic. The history of that Sagacious Animal, the Learned PIG, in America in the late eighteenth and early nineteenth centuries turns out to be far longer and twistier than the Tail of most members of the Species. It begins just a few years after Toby, the original of that Act, was exhibited in London in the 1780s, and—like so many other American phenomena—the first sign of it is a lawsuit. In a Philadelphia paper of June 9th, 1792, under the heading “LAW INTELLIGENCE” we learn of an action brought by one Mr. Williams against the landlord of the George Inn in the Haymarket, who had distrained both his pig and his caravan against some unspecified debt. The judge opined, and the jury agreed, that—as tools of the trade—both animal and wagon were exempt from such seizure, and returned a verdict in the plaintiff’s favor. Of this pioneer Mr. Williams and his learned companion nothing more is heard. The next we hear of our estimable friend comes two years later, and comes upon the Stage, with no actual Pig in sight. A comic song, “Of the LEARNED PIG and TIPPY BOBBY,” debuted upon the stage in Boston in June of 1794, as an entr’acte between a play titled Which is a Man and a farce known as Animal Magnetism. The same song is also mentioned in connection with other productions of this time, including “How To Grow Rich,” which was performed at the New Theatre in Hartford in September of 1796. And then the pigs start to appear in earnest: In 1797 a sapient Swine—claimed to be the same one “shewn in London at half a crown each person”—debuted at No. 219 South 2nd Street in Philadelphia. By July of that year, the same pig, or at least one with very similar advertising copy, appeared in New York at Mr. Marling’s Long Room, No. 87 Nassau-Street, where he was soon joined by a variety of companion amusements, including the “celebrated TURK,” an infamous chess-playing faux-automaton operated by a dwarf concealed behind the works (and debunked some years later by Edgar Allan Poe). The pig’s run was extended again and again, with a “last chance” advertised on October 2nd, after which he seems to have gone into (a doubtless well-earned) retirement. The next Pig to strut the boards is that of William Pinchbeck, which I’ve blogged about; in his advertisements he claimed that his Pig was the London original, and had been purchased for a thousand dollars in Philadelphia. However, Pinchbeck’s later Expositor describes the pig’s training, suggesting that he brought this animal to its sense himself. Pinchbeck had an extended run in Boston in a room underneath Bowen’s Museum of curiosities, and then embarked on a tour that included Newburyport, Salem, and (as discussed here) Providence, which he reached in September of 1798. He advertisements fade away soon after this, although the Pig is mentioned prominently in his notices for his Expositor. 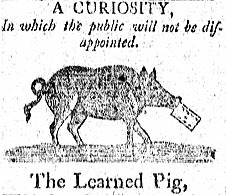 Another pig, under the banner of “A Curiosity in which the Public will not be Disappointed” (see above) appeared in Philadelphia, Alexandria, Albany, and New York. Although there is a long tradition of Mr. Gadsby’s Tavern in Alexandria having been home to one of these sagacious animals, this pig appeared at a rival establishment, Mr. Charles McKnight’s Eagle Tavern, in 1801. And, shortly after that, another pig appeared, with the motto “Seeing is Believing.” It astonished the visitors at the Rising Sun Hotel, Market Street, Philadelphia, by telling the time of day, distinguishing colors, counting the company present, and so forth. A final, late-arriving porcine prognosticator arrived in 1806 in Alexandria, where he was exhibited at Mr. John Bogan’s Spring-Garden. The newspapers of this period are filled with allusions to the Learned Pig, most of them treating the act as a single, well-known attraction, although one Philadelphia paper noted in 1803 that “within four years four learned pigs had been exhibited.” The anecdote of Dr. Johnson’s remarks on the Pig was widely reprinted, and as J. L. Bell has described, the animal was often the subject of political satires and diatribes. Russell Potter will speak about this history and his novel PYG at Gadsby’s Tavern Museum in Alexandria, Virginia, on Saturday, 20 October, at 3:30 P.M.